Recorded in 2016, this disc on prima facie provides something of a celebration of composer Daryl Runswick's 70th birthday (he was born in 1946). Pianist Tony Hymas performs four of Runswick's piano works which span almost 30 years of Runswick's music making and showcase the stylistic diversity of his art. 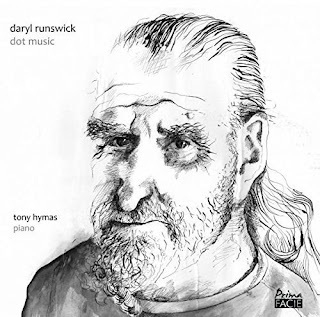 Hymas opens with the disc's title track, dot music, a 2000/2001 piece (revised 2013-2016) named for Runswick's music notation where he writes just the black dots on the stave (no stems, rests and bar-lines) and leaves the performer free to interpret/improvise based on the graphic distance between the notes (an interesting compromise between classic notation and a fully graphic score). In three movements, the first is a free flowing prelude marked Scherzando, the second spare yet lyrical with a sense of individual notes being placed, whilst the finale alternates spiky fast and rhythmic material with sparer sections. Runswick's Sonatina from 1981 (revised 2003) combines an advanced jazz style with classical structure; something which Runswick, in his booklet not admit cost him much effort and heartache. So the opening movement is structure in sonata form, but with jazz-based material with quite a romantic feel. The middle movement is slow bluesy, spare at times and thoughtful, whilst the finale is a catchy jazz ballad. Along with John Cage, Miles Davis, John Coltrane, the Beatles and Joni Mitchell, Pierre Boulez was a great influence on Runswick and when Boulez died Runswick created a tone row from Boulez's name. In Six studies on b-o-u-l-e-z from 2016, Runswick uses this tone row in a variety of styles, referencing different types of modernism, along with hints of minimalism, as well as free jazz, improvisation and much else. The result is a dazzling series of stylistic preludes, in which neo-Boulez modernism shades into romanticism and much else, giving us a glimpse of the poly-stylistic nature of Runswick's art and the sheer bravura of his invention. The final work on the disc is a work Runswick originally wrote for his composition portfolio as a student at Cambridge in 1967, here played in the 2003 revision, Introduction and Fugue in B minor. It combines a four voiced fugue with the influence of jazz. It was the second fugue which Runswick had written, and he has never returned to the form since! The result, like the sonatina, is a remarkable combination of classical structure with jazz influences. Throughout, Tony Hymas proves himself a deft interpreter of Runswick's different stylistic incarnations, playing with virtuosity and with style.